Online Scheduling is available for established clients only. 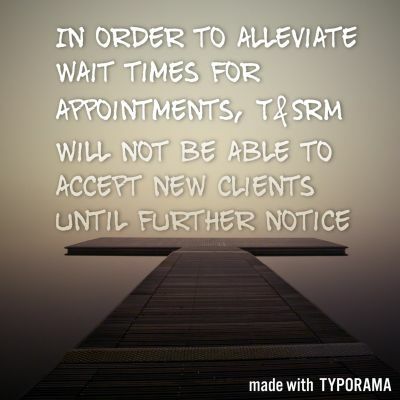 T&SRM is currently at capacity and is unable to accept new clients at this time. All you need to schedule online is click the button below and you will be guided through picking a provider, choosing a date, and choosing a time for your massage. Then you will set up your account with your name and contact information. If this is your first time scheduling online, the secure scheduling system will require a credit/debit card to hold your appointment time. YOU WILL RECIEVE A CONFIRMATION EMAIL AND A REMINDER EMAIL. If you haven't recieved a confirmation email, then the appointment making process was not completed. Payment is due at the the time of service, and you may use another form of payment at that time. You will recieve a confirmation email when your appointment is scheduled. You can set up your account to give you text reminders of your upcoming appointments, and you can use your account to keep track of upcoming and past appointments! If you have an iPhone, the scheduling software Schedulicity has an app for you to schedule easily from your phone! Keep in mind that evening appointments fill up quickly and there may be a 12 week wait for popular times. Don't wait, book today to reserve your time on the schedule!